Although the Seattle Seahawks were a fan favorite for their 43-8 win over the Denver Broncos Feb. 2, 2014, did you know the two teams affect more than people’s choices on who to root for? 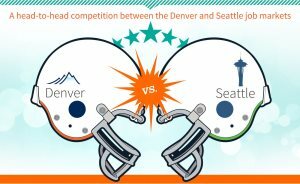 According to an infographic from Simply Hired, both Denver and Seattle saw an increase in job seeker interest on the site after the January 2014 playoffs—and like the Super Bowl, Seattle took first place. At +29 percent of unique job seekers using Simply Hired to look for jobs in the city, Seattle received a 10x boost in job seekers compared to Denver’s +3 percent. But does the Super Bowl play the biggest factor in drawing job seekers to the city, or is it all about the city’s total package? From Dec. 2012 to 2013, Seattle saw a +3 percent increase in open positions while Denver saw a +2 percent increase. From Jan. 2012 to 2013, Denver saw two times more growth in its fastest growing occupations than Seattle. These included occupations such as graphic designers, search market strategists and web developers. Sixty-seven percent of job seekers look for open positions in Denver, which is 4 percentage points higher than those who look in Seattle. Seven percent of Denver residents search for jobs in Seattle while only 4 percent of Seattle residents look for jobs in Denver. When it comes to the number of sunny days (115) per year and the average home prices ($239k), Denver takes the gold. Yet, because it pays its workers nearly $5,000 more, Seattle takes the gold for average annual salaries. Although the infographic says it was a close call, Seattle ends up taking more job seekers’ interests into the end zone.